I think it's a speed/cadence sensor built into a lot of Giant road bikes. Was that over ANT+ or Bluetooth, Rockinrose123? CooSpo H6 ANT+/BTLE HRM works well (both protocols tested). This is a cheapy gadget typically available through eBay, Alibaba etc. for less than half of price of Garmin/Suunto/Wahoo heart rate straps. I decided to pair them all as ANT+, for no particular reason other than the fact that the Garmin ones don't do BT. I bought the Geonaute to pair with my iPhone (BT) when I used the iPhone Strava app, but stopped using that after a couple of rides and went back to my Garmin Edge 500, which came with the Garmin sensors. The Geonaute is handy in the gym where there are some ANT+ machines and some BT ones, and it was a lot cheaper than anything else. I bought the Bontrager speed/cadence sensor for my new bike in the expectation of receiving my Karoo as you can't quickly transfer these dual purpose sensors between bikes. Garmin now sell separate speed and cadence sensors and to be honest I wonder whether I should have just bought a cadence sensor and relied on GPS for speed and distance. 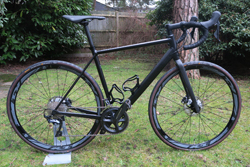 However, the Bontrager wasn't much more expensive than the Garmin cadence sensor and having BT as well as ANT+ means I could choose just about any computer to go with it. Sigma sport sensors: chest strap, cadence and speed don't pair. I bought sensors from Garmin and they paired quickly and perfectly. Paired successfully to Karoo via ANT+ (paired to Apps on iPhone via Bluetooth). As of yesterday I would have said all 3 appear to be working properly. Over 5 rides maximum speeds all seemed correct, Cadence was recorded on 4 of the 5 rides and 3 of those 4 seemed correct (one was 145 which seemed unlikely). However, today I recorded 3 rides. The average speeds and average cadences all seemed ok. I got maximum cadences of 179, 110 and 93. The second is possible but the first is not. Maximum speeds were 32.4, 25.1 and 682.2 mph. First and second seem right, but third is not! I think I've gotten caught up on most (all?) recent entries. Thanks for putting them in. I've tried to give credit. If I've missed you, please speak up. Also, please try to look through the list before reporting devices. Several recent posts contained devices already on the list and known to work. Saves us both some time. You didn't include the Shimano Powermeter from my last reply Maybe you overlooked it as it was only mentioned second. I can also confirm MIO (I believe Magellan in US) magnet less speed sensor working without issue. You didn't include the Shimano Powermeter from my last reply Maybe you overlooked it as it was only mentioned second.I can also confirm MIO (I believe Magellan in US) magnet less speed sensor working without issue. I did miss the Shimano reference in the paragraph. It's added now. Do you have a slightly more detailed model number/name for the Mio/Magellan? There's already one or two (?) in the list, so I'm wondering if this is just a duplicate? Scosche Rhythm+ pairs up just fine for heart rate. I have the magnet less version, the Mio Cyclo 605. I only use the speed component as cadance is supplied by the Shimano power meter. Cadence: Lixada Bike Cadence Sensor from Amazon.co.uk - box branded as Cycplus Smart Cadence Sensor C2 Magnetless Bluetooth and ANT+ multi-protocol. All you have to do is shake it to make it detectable, showed up both as ANT+ and Bluetooth, paired both and enabled ANT+, disabling Bluetooth. I can't report on the Bluetooth operation but it works perfectly on ANT+, stuck to the crank arm with double sided tape with a cable tie for security. Much cheaper than the known brands. List should be up-to-date as of May 31. Is anyone here using the Wahoo TICKR, I am now trying to get my karoo to connect but after a few hours still not saying it has found the Wahoo, it has found devices but no named device. could be that the battery in the Wahoo is flat as it had no insulating card so leaving the batter in contact with the Wahoo. I mean there is no switch and not much info on how this device works. My Karoo has given up on trying to pair with any device now. I'm pretty sure that Doug uses a TICKR. I imagine that it works the same as other HRMs in that it only starts using battery when it detects a heartbeat, i.e. when you put it on. Probably a good idea to check the battery in the TICKR.